Argon gas makes for a better approach to leftover paint storage. It keeps oil-based paints, varnishes, and stains in freshly-opened-can shape and looking like new. A spray of argon gas creates a barrier between the liquid and the air inside an open can. This prevents the finish from curing, yellowing, or skinning-over. Argon is non-toxic, non-flammable, and inert, so it won’t react to other chemicals. Dimensions: 3" x 3" x 9.5"
Argon gas is a better, non-toxic approach to leftover paint storage. 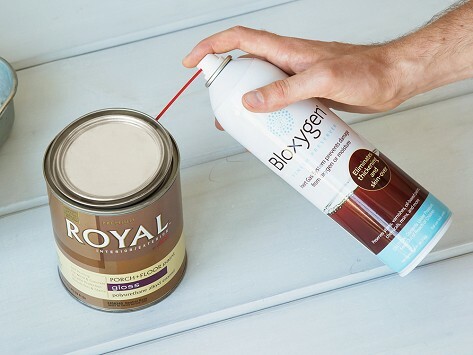 Bloxygen harnesses argon gas in a spray can so you can keep oil-based paints, varnishes, and stains from curing—or yellowing—over time. Exposure to air is what causes these finishes to break down, which is where Bloxygen comes in. Spray it inside an open can and the argon gas lays atop the liquid, creating a barrier against air in the can. (Argon is heavier than oxygen.) The gas is inert so it won’t react with other chemicals and it’s non-flammable, too. Maker Steve Zawalick researched, tinkered, and even checked in with a NASA-funded makers program when creating Bloxygen. Steve is a woodworker and nuclear engineer, so he was well-suited to tackle this scientific approach to preserving finishes.